Background and early lifeIsaac Swainson was the son of John Swainson (d1750), yeoman, of High House, Hawkshead, Lancashire by his second wife Lydia Park, and grandson of Christopher Swainson (d1722), who married, in 1692, Agnes, daughter and eventually heiress of Henry Sawrey of High House. Born in 1746 he made his way as a young man to London to seek his fortune and, after working as a woollen draper he served as assistant to a Dr. Mercier in Frith Street, Soho. Later, he purchased from Dr Mercier the recipe of a patent medicine called "Velnos' Vegetable Syrup". This medicine became well-known, and was extravagantly puffed in Bannantine's collection of squibs called 'New Joe Miller' (1800-1801). By this he reputedly made as much as £5,000 a year from sales of the preparation. He apparently also studied orthodox medicine, taking his MD in 1785, although there is no record of his subsequent election to the Royal College of Physicians. He was, however, best known as a learned and indefatigable botanist, especially in medical botany. Shortly after 1788 he took a lease of the Heath Lane Lodge estate in Twickenham. This copyhold property was acquired in that year by Welbore Ellis, son-in-law of the late Sir William Stanhope, and now owner of Pope's Villa, Riversdale (Shirley House) and Cross Deep Lodge. Most of the earlier mansion had been demolished by its owner the Hon George Shirley in 1783. A new house was built, to the design of the Scottish architect Robert Mitchell, either by Ellis or, conceivably, by Swainson himself. 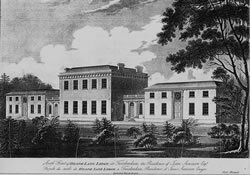 An engraving of this house was published in 1801 described as Heath Lane Lodge, at Twickenham, the Residence of Isaac Swainson, Esqr..
,,,he was a celebrated cultivator of the vine…also successfully attentive to the culture of other choice natural and forced fruits and had the finest of every kind of any gentleman in this part of the country. In 1811 Daniel Lysons noted that the garden was Scientifically arranged and elegantly laid out, which may be considered as the first private collection of the kind in the kingdom and J C Loudon wrote that It contained every tree and shrub that could be procured at the time in British nurseries, and was kept in the first style of order and neatness. Swainson was reputed to be in the habit of driving his coach out of the gates of the Twickenham mansion at a canter, possibly in order to impress his neighbours. 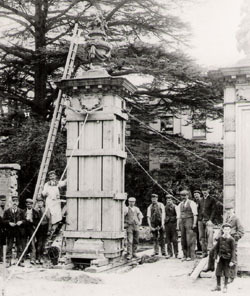 The gate posts had survived the demolition of the earlier house and, in fact, survived until well into the 20th century. A photograph of about 1902 shows them being moved back to permit road widening for the tram tracks along Heath Road. 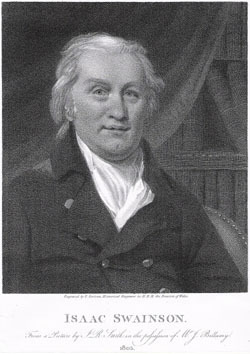 Swainson's portrait was painted by James Raphael Smith and engraved in 1803 by E Scriven. It shows an amiable and genial personality who appears to have been well liked. The portrait was owned, and may have been commissioned by his friend John Bellamy, wine merchant, whose cellars were beneath the Houses of Parliament where they could offer refreshment to the Yeomen of the Guard following their annual search. Swainson died on 7 March 1812 at his house in Frith Street, Soho and was brought to Twickenham for burial in the Holly Road Burial Ground on 14 March, where his wife, Mary, had been buried in 1806. The Gentleman's Magazine printed a fulsome encomium on his life and character. There were no children of the marriage; he left his entire estate to his niece Margaret Canham (1766-1837) and this included the balance of the lease on Heath Lane Lodge as well as his house in Frith Street. Margaret had married Thomas Canham (1773-1825) of the Middle Temple, in 1810, a comparatively late marriage. Margaret retained the property until her death in 1837 when she too was buried alongside her uncle and her husband in the Holly Road burial ground. Between 1812 and 1837 the garden was managed for Margaret by Robert Castles and his wife, though not to the same high standard as during Swainson's lifetime. compiled from material kindly contributed by Richard Strong. Jean Joseph Vergely de Velnos, Dissertation sur un nouveau remede, 8vo, Paris, 1768. Copy in British Library, shelfmark 1174. b. 24.